The Kennedy volleyball team rebounded from their lone loss of the season by pulling off six straight wins last week, culminating in a 2-1 victory over the hosting Salem Academy team in the Crusaders' home tournament on Saturday. The No. 3 Trojans (16-1, 8-0 Tri-River Conference), were coming off a 2-0 loss to Kings Way of Washington in their own tournament the week before, but responded in emphatic fashion over the course of a five-day period. Kennedy opened the week with a 3-0 sweep (25-10, 25-7, 25-8) of the Chemawa Braves on Sept. 18 and followed with back-to-back 3-0 wins over Santiam (25-19, 25-13, 25-16) and Gervais (25-11, 25-9, 25-15) at Gervais High School on Thursday to remain unbeaten in league play. Over the weekend, Kennedy cruised through pool play at the Salem Academy tournament and opened the bracket with a 2-0 win (25-17, 25-19) against Yamhill-Carlton. The Trojans followed with a 2-1 victory (25-18, 24-26, 15-13) over 3A No. 5 Harrisburg in the semifinals and claimed a 2-1 win (18-25, 25-21, 15-8) over the 3A No. 6 Crusaders in the championship game. Kennedy was scheduled to play at Delphian on Tuesday and wraps up the week with a non-conference home game against Portland Christian on Thursday. The St. Paul volleyball team continues to play at the top of its class after sweeping its league opponents last week and winning its home tournament against a pair of powerhouse 2A teams. The No. 2 Buckaroos (11-0, 7-0 Casco League), took dominating 3-0 road wins against Falls City (25-20, 25-3, 25-12) and C.S. Lewis Academy 25-5, 25-7, 25-3) during the week, then claimed victory over two of the best 2A teams in the state at home on Saturday. After going 3-0 against their pool, the Bucks opened the tournament bracket in the semifinals against 2A No. 5 Central Linn, beating the Cobras 2-1 (22-25, 25-14, 15-9). That led to a championship match against 2A No. 8 Culver, beating them 2-0 (25-14, 25-22) to win the tournament and hand the Bulldogs their first loss of the season. St. Paul was scheduled to host Livingstone Adventist and Central Linn in a league/non-league double header on Monday, followed by a game against Willamette Valley Christian on Wednesday. The Bucks wrap up the week at a tournament hosted by McKenzie High School on Saturday. The North Marion volleyball team enjoyed its best week of the season, taking back-to-back road victories to open its league schedule and finishing by winning the Elmira Tournament on Saturday. 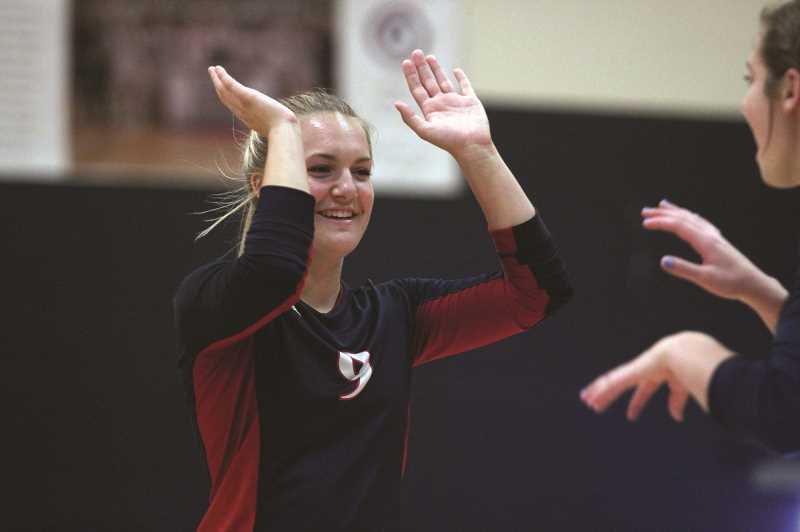 The Huskies (7-3, 2-0 Tri-Valley Conference) were coming off of two straight losses when they travelled to Molalla High School on Sept. 17, beating the hosting Indians 3-0 (25-21, 25-17, 25-14) in the league opener for both teams. North Marion travelled to Madras on Thursday, and responded to losing its first match by taking the next three, downing the Buffaloes 3-1 (22-25, 25-16, 25-17, 25-13). On Saturday, the Huskies travelled to Elmira High School and beat former Oregon West rival Newport 2-0 (25-6, 25-10) in the bracket semifinals before claiming the tournament championship over Phoenix with a 2-0 win (25-13, 25-16) against the Pirates. The Huskies were scheduled to host Estacada on Tuesday, followed by a trip to Gladstone to wrap up the week on Thursday. The Gervais volleyball team had a pair of strong showings this week against Sheridan and Santiam, but were unable to convert their positive gains into wins as the team slipped to seventh in the conference standings. The Cougars (2-8, 2-6 Tri-River Conference) opened the week at Sheridan High School, falling 3-1 (25-16, 25-18, 21-25, 25-22) to the hosting Spartans on Sept. 18. Gervais followed with its own home double header on Thursday, and opened well against Santiam before the Wolverines came charging back in the final three sets to win 3-1 (18-25, 25-17, 26-24, 25-20). The Cougars finished the night with a 3-0 loss (25-11, 25-9, 25-15) to the Kennedy Trojans. Gervais wrapped up the week with a trip to Salem Academy for the Crusaders' home tournament. The Cougars fell in the first round of their bracket 2-0 (25-14, 25-20) to the Oregon Episcopal Aardvarks. Gervais continues league play this week with a game at Colton that was scheduled for Tuesday, followed by a trip to Delphian on Thursday. The Woodburn volleyball team continues to search for its first win of the season after falling in back-to-back games last week. The Bulldogs (0-11, 0-5 Oregon West Conference) fell 3-0 (25-21, 25-16, 25-12) to Newport on Sept. 18 and followed with a 3-0 loss at Cascade (25-14, 25-12, 25-17) on Thursday. Woodburn was scheduled to play at Philomath on Tuesday and at Sweet Home on Thursday.